16 Jul 2016: At last…I’ve found my smell! Here’s another chap to add to my collection. The painting style reminds me of Primitive American paintings. A style which I find very appealing. It’s oil painted on tin, similar to my Mexican retablos, so I’m guessing it’s possible that this dapper young man hails from Mexico too. So I’m calling him Pablo. Though he could as easily be American. Pablo’s clothing suggests mid 1800s. The Victorian style is too generic to pinpoint a more accurate geographical location, although I’m saying no to British as I don’t think they painted much on tin (if at all?). I’m certainly open to suggestions. My art detective skills are not as acute as I would like. As usual the portrait is in a bit of a state, but I like that. There is a bit of exposed tin in places. It’s particularly noticeable around the pupils which is a shame, but when it catches the light it gives an eerie effect. He’s a particularly pretty boy with a friendly, gentle expression. I get the impression Pablo was the apple of someone’s eye. 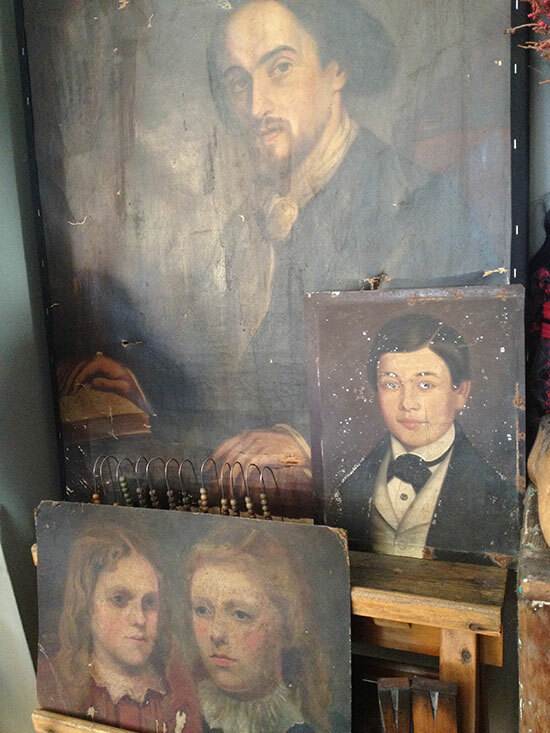 At the moment, I’ve plonked him on my trestle easel leaning against Ichabod (my much larger Victorian oil painting). Their sombre tones blend nicely.